Used the Mock Mill to grind my cornmeal. There isn’t much information out there so had to experiment. I ordered 6# of Hoosier Hill Farm yellow popcorn. Haha I was optimistic about my new project! I used “10” to start thinking it would be good for polenta. I then took out one cup of that and moved down to “5” then “1”. 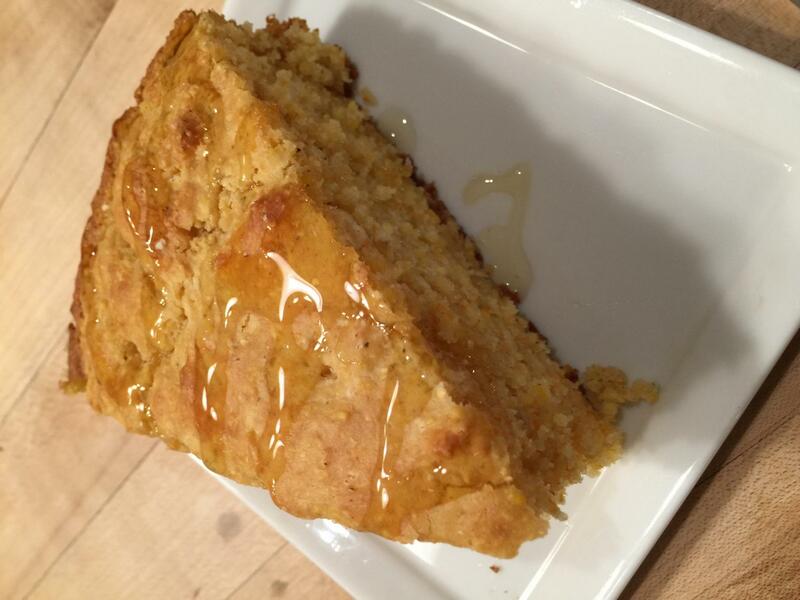 The cornbread is amazing with fresh ground corn! But there are a few crunchy bits. I reset the mill to get a new set of “10” finer grinds. I started at the new “10” then went to “5” and then tried moving toward “1” but the mill stalled. I quickly moved back to about “3”. Perfect! I was using the same cup of cornmeal for the regrinding. The info I would pass on as a result of this is: buy good quality popcorn, start on your coarsest setting and work down. Depending on what your desired recipe is you can go coarse for polenta and finer for grits and finer yet for cornmeal. Do not buy dent corn as it is field corn and intended for 4 legged critters. The ultimate would be fresh corn cut off the cob and dehydrated and then ground. That’s my plan come Summer. Served hot with local honey... yum! and yours looks scrumptious! Especially with local honey! I should check to see if I can mill corn in my Komo. This blog says they did grind corn...they used dent which isn't optimal. The cheap corn meal you get already ground and the mixes you buy on the store shelf are often made with cheap field " dent" corn which is intended for farm animals to eat. The best quality corn is popcorn. I can hardly wait to try fresh dehydrated corn. it will be softer so easier to grind and if you google some blogs you can see the amazing yellow color. Always fun to experiment. Is this one of those "Bumble Bees can't fly" deals? 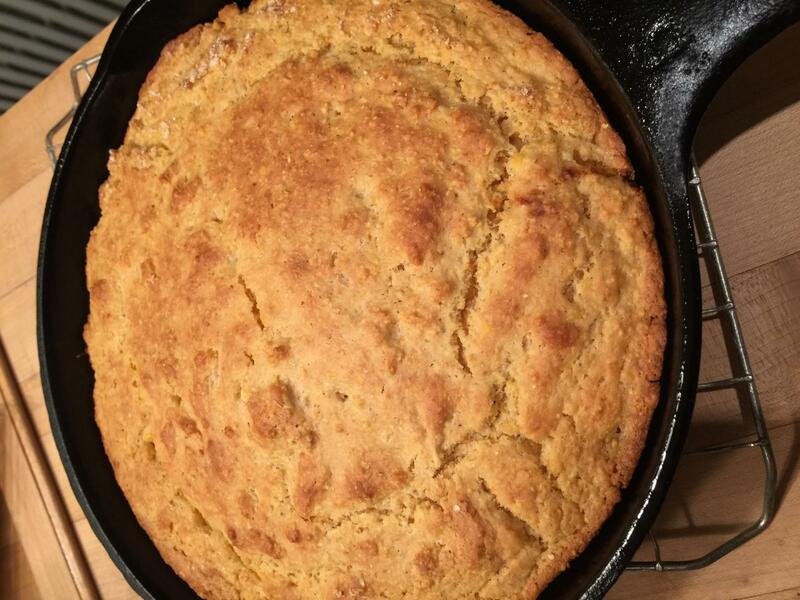 Your cornbread looks wonderful, Caroline. Waiting for updates. I have a Goodwill $5 blender that I am willing to test some of the corn in. I will see if it cracks it and then proceed to mill it again after breaking it down a bit. I don’t want to break my stones but I do want to give it one more try. its an old old blender but I can put in about 1c corn and blend it to the point that my MM didn’t have any problem millling it on a fine enough setting for cornbread and polenta at a slightly coarser setting. I’ve now ground 1 1/2 # out of 6 and will be making several things this week with it. In future I will only purchase heirloom corn specifically meant for grinding but at least this does work and the taste is fantastic. Ohhh Yes! Peak flavor from freshly milled corn especially if you also use freshly milled wheat too. I'm not too sure about your plan to cut sweet corn from the cob and dehydrate it. That might not work quite the way you expect. But using freshly cut kernels in the cornbread batter is certainly an enhancement. I'm getting ready to attempt nixtamalizing my corn to make masa for fresh tortillas and of course if you dehydrate the nixtamalized kernels and grind them into meal it adds a definite punch to your cornbread. there is some info out there about dehydrating sweet corn and then grinding for cornmeal . The link above has several good sources of info and pictures. It's interesting that the one blogger is using the WonderMill with the company's blessing to grind popcorn and with way faster/better result than I got on one pass. As I said above I will finish out this bunch of popcorn but will then switch to dent corn to get a softer starchier kernel. My main concern with the fresh corn stripped, dehydrated and ground had to do with the partial perhaps full loss of the kernel's germ. I suspect the germ is an important part corn's nutrition and an essential element of the flavor difference between fresh milled and commercial meal. I'm sure it can be made to work but, for me, the flavor differential and nutritional loss not to mention the extra time and energy needed to prepare it would make me discount it in favor of purchasing dried corn. After all the kernels are in a form that's ready for long term storage without any need to blanche, strip, and dry them. In regard to milling popcorn I suspect the toughness of the pericarp and the smaller amount of endosperm in the typical popcorn kernel are factors in some mill manufacturer's objection to them plus the fact that kernels have to have fairly high moisture content in order to pop. Mills with steel burrs or impact/micronizing mills will probably handle them just fine. I have it on my list to try grinding my own corn and you have saved me a lot of work :). I do remember someone on one of the FB sites I follow mentioning popped corn is a no-no in the Mockmill. Glad you figured it out before you burned the mill out :). Where are you buying your softer corn from? If you can share that would be great. Thanks and great looking corn bread! We ate the last of the pan of corn bread at lunch today and I must say that the reheating in the microwave was the most successful with this batch than any other in the past. It is just so moist and full flavored. Wade's Mill is right up the road from Lexington VA and I am going to get some yellow corn from them , unground, when I finish all the popcorn. They will sell me anything unground if I ask ahead of time so they can get it bagged. I get my rye unground from them as well . I did get unbleached wheat from them but it is really expensive so I likely will continue with Arrowhead Mills and KA for my unbleached flour. I found out from them that is requires a " 200" sifter to make unbleached flour ! That would be a job to sift !! I am sure since you are in NY that there are mills in the area that you can get the whole kernel yellow corn so you don't have to pay shipping. I would look around and see what is available.